Snow cones are a southern thing. Should that be a capital? A Southern thing? Yes. That looks more Paula Deen-ee. When I first moved to Texas, the kids in class with me talked about snow cone stands. Which one was the best, which one was adequate, and which ones to avoid all together. My Yankee brain didn’t understand this. What’s the big whup with snow cones? Any Northerner who has left a can of pop in the garage in January…homemade snow cone. Now, ice cream. Ice cream I get and ice cream is something the North does right. I don’t care what your personal Southern ice creamery is, but I put it up against Sherman’s in South Haven, MI any day of the year. Well, that’s my rant about snow cones. 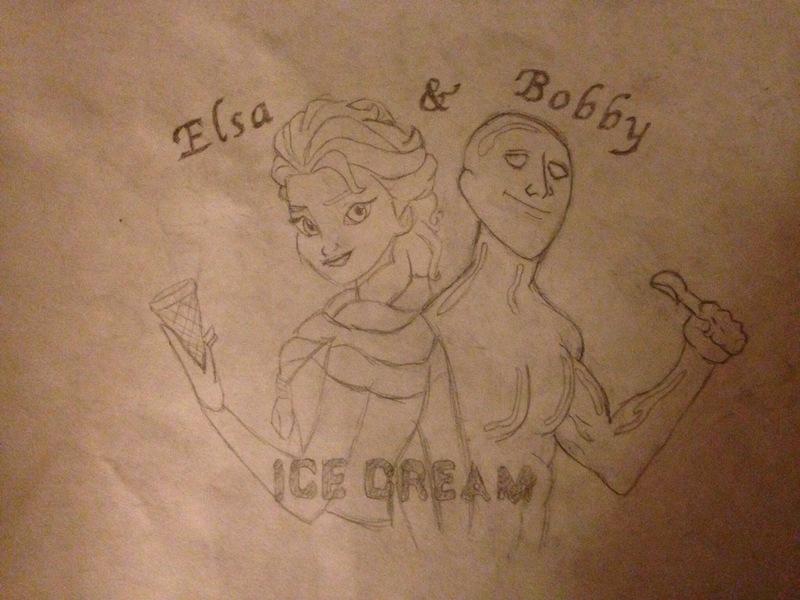 And that’s why I drew this picture (which is mostly traced from the Internet) for ice cream, not snow cones. Bobby is Bobby Drake AKA Iceman from the X-men. I wish this was a t-shirt. This entry was posted on April 25, 2014 by Kate Cornell. It was filed under Generalities and was tagged with bobby drake, elsa, frozen, ice cream, nerd shirt, snow cone, Snow cones.